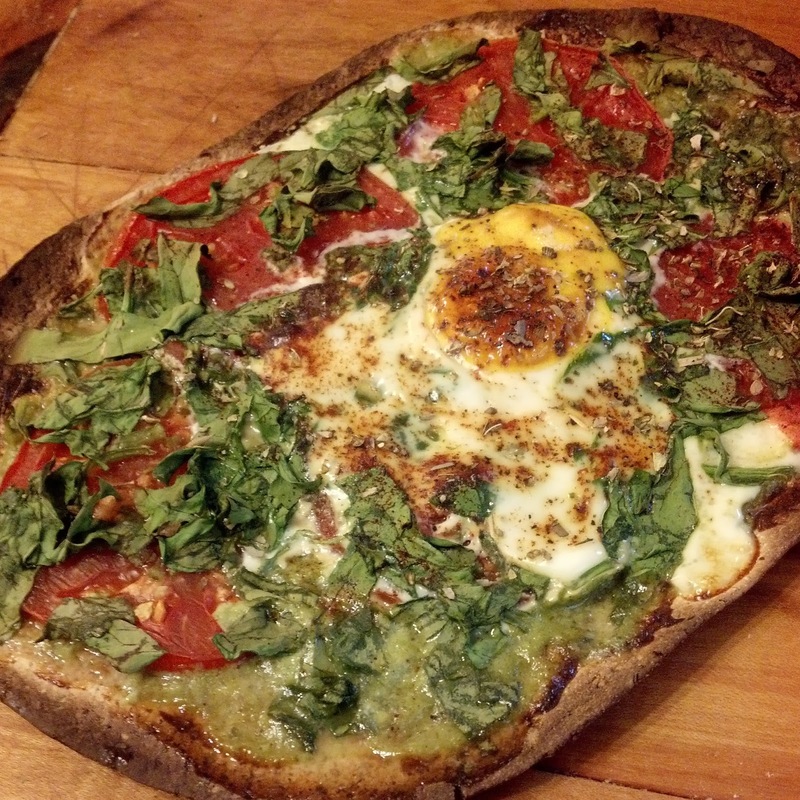 The Cozy Escape: Protein Breakfast Pizza - Under 300 Calories...For the Whole Pizza! In a blender or magic bullet, blend together the cottage cheese, garlic clove, fresh basil, a dash of salt, and a dash of pepper until in forms into a creamy sauce; this only takes a few seconds. Place the flatbread on a pizza pan, for it'll be easier to transfer into the oven. Spread the "sauce" all over the flatbread evenly; there is surprisingly a nice, thick amount to spread over the entire thing - no thin layers, woohoo! Over the sauce, lay some freshly sliced tomatoes, and then top with the chopped spinach. Crack an egg over the top of the spinach, in the middle for all you presentation-savvy chefs out there. Sprinkle the entire pizza with a little pepper, garlic powder, dried oregano, dried basil, and paprika. Pop the pizza into the oven, and bake for 15-25 minutes, until the egg whites are completely white and the yolk is at your desired consistency. 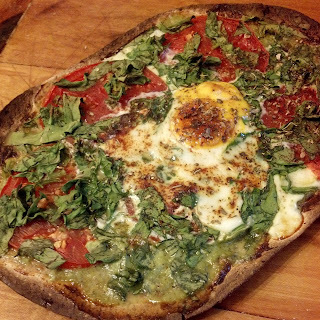 If you like runnier eggs, hold the pizza in for more the 15-20 minute range. I like my egg yolk fully cooked, so I kept the pizza in for more the 25 minute range and set the broiler on low for the last 2 minutes.